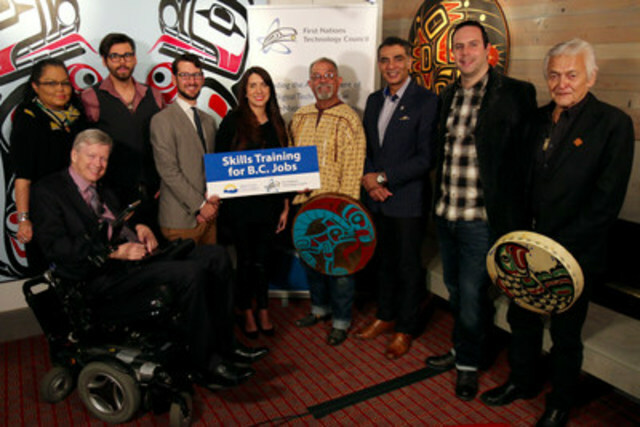 COAST SALISH TERRITORY, BC, April 4, 2016 /CNW/ - The First Nations Technology Council announces the launch of Bridging to Technology, the foundational program to BC's Indigenous Technology Talent Development Strategy. This innovative approach to skills development convenes key partners to create meaningful training, mentorship and job placement opportunities for Indigenous people in a knowledge-based and connected economy. On March 29th the Honourable Minister of Technology, Innovation and Citizens' Services, Amrik Virkand MLA for Vancouver-False Creek, Sam Sullivan came together with the Technology Council to officially launch the Bridging to Technology program with a $515,000 investment from the Province of British Columbia and a $100,000 investment from the All Nations Trust Company, Pathways to Technology Project. The First Nations Technology Council will play a convening role, bringing as many partners as possible together to form a robust strategy and approach to building technology skills and opportunity across the province. The First Nations Technology Council (http://www.technologycouncil.ca/) is an enterprising non-profit mandated by First Nations communities to address the digital and connected technology needs of First Nations in BC. The Technology Council plays a specific role in convening communities, government, academic institutions and the social innovation sector to facilitate the development of digital ecosystems that are balanced in approach, harmonious with First Nations values and sustainable in operational and growth strategy. With digital skills development at the heart of its purpose and work, the Technology Council offers a unique opportunity to get involved in building an Indigenous technology ecosystem led by First Nations and ground-breaking in the province.